“The general security situation in Darfur remains calm, except for sporadic clashes between the Sudan Liberation Army of Mr. Abdul Wahid, Government forces and nomads in the Jebel Marra,” said Jeremiah Mamabolo, Head of the African Union-UN Mission in Darfur (UNAMID), speaking via video-link. The mission is in the process of reconfiguring its forces, including the construction of a new Temporary Operating Base at Golo, on land provided by the government in Jebel Marra. 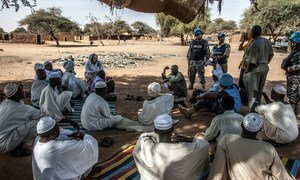 The reconfiguration has involved withdrawl from some areas previously controlled by UNAMID. While it was too early to make a final assessment, Mr. Mamabolo said there had been no “adverse impact” so far. Mr. Mamabolo saw what he called “a glimpse of hope” in the stalled peace process with parties expressing a desire “for continued engagement” at a meeting in Berlin last month. “I am, therefore, in contact with all the parties to bridge their differences so that they can agree on and sign a pre-negotiation framework as soon as possible” to pave the way for a “cessation of hostilities agreement and direct negotiations,” he said. Turning to the humanitarian situation, revised figures reveal that some 1.76 million displaced people are registered in approximately 66 camps. With no systematic registration of those displaced outside the camps however, estimates vary considerably for those unregistered and living in rural settlements and urban areas. UN humanitarian agencies and partners estimate that an additional 500,000 displaced people live in some 108 host communities and settlements in Darfur. Mr. Mamabolo indicated that from UNAMID’s interactions, they would like to return to their places of origin, provided they have security and basic services. Meanwhile, others say they are willing to settle where they are – with assurances that they retain their traditional land rights in their original homes. For Darfur to be guaranteed “durable peace and development, durable solutions will have to be found for the plight of IDPs,” he stressed. “It is imperative that concerted efforts be exerted towards mobilization of financial resources to consolidate and sustain the prevailing peace and stability in the region,” he concluded. The Report of the Secretary-General on the African Union-United Nations Hybrid Operation in Darfur can be found here: S/2018/389. The African Union (AU) and the United Nations are actively discussing with the Government of Sudan how best to configure a strategy for AU-UN peacekeeping to eventually leave Darfur, the head of that operation said today.